Streamline your communication. Frustration skyrockets when members find it hard to receive important information. Worse yet when some members don’t receive messages at all. SquadFusion helps you get that important information to your members. SquadFusion Club Management Software can help keep messaging from overwhelming you or them. 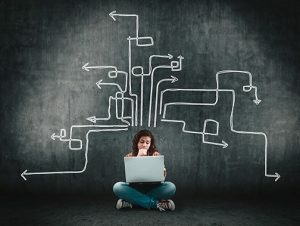 Your customers need unique information and feedback, so they are happy and have fun. Schedules and locations can change with little notice during nutty times. People need timely updates. SquadFusion Sports Management Software allows you to move your communication online. You no longer have to saturate club members with email. Your members will thank you for stemming the flood to their inboxes and text messages. They won’t have to scroll back to a text message from several weeks ago to get that crucial information. And no more worrying about those folks who never seem to get your updates. To get messages to your customers, you need up-to-date contact information. Hand entering information into a master spreadsheet is slow and prone to errors. Copying and pasting from everywhere can cause the same mistakes. SquadFusion Sports Management App makes it fast and easy for your customers to enter it. Your data will always be current. Having the correct contact information is only the first challenge. You have to make sure the right people, and only the right people, get the right messages. The days of sending a blast to the whole organization when your message only applies to a subset are done. We all receive so many messages from tons of different sources. We’re quick to ignore people who send us irrelevant information. SquadFusion Sports Management Software helps you keep your messages on point. SquadFusion puts your customers in control of how they receive messages. They may wish to receive a text message for some types of messages. For other types, they may wish to receive an email. If they are going to be on the website all the time, perhaps not receive any notification. You, as the sender, do not need to worry about each of your customers’ preferences. You can say whether a particular message is appropriate for text messaging. But if your customer wants it in an email, that’s how they will receive it. Messaging people the way they prefer increases their satisfaction. More importantly, it increases their attention to your message! If you run a medium or large organization, chances are you need help all the communication needed. There’s too much to say to too many people for one person to do it all. SquadFusion sends a lot of the routine communication automatically. You won’t need to send any more weekly reminders. No more keeping track in email whether participants are planning to attend events. SquadFusion helps you empower everyone in your organization to communicate effectively. 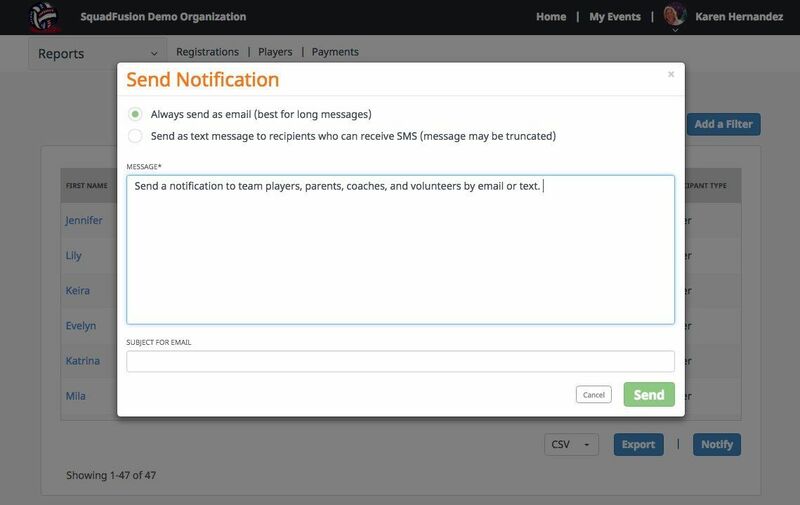 Coaches, captains, and team parents can easily send messages to their squads. Program directors and commissioners can easily do so within their programs. You can have unlimited people be able to message across your entire organization. You should delegate some communication tasks. Even then you can still keep tabs on communication. You can have yourself (and others) copied on bulk messages. You can weigh in on discussion topics, see who has responded to an event, etc. Of course, email and text messages can be useful. But, do you have multiple email distribution lists and group messages? Are you sure they’re accurate and current? There’s a better way! 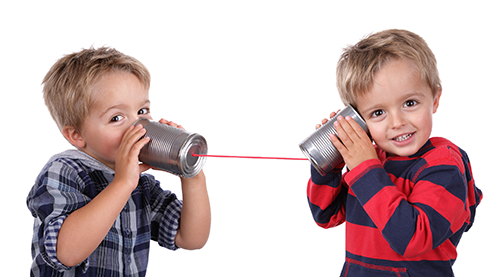 Bring all your communication together with SquadFusion. You can send group emails and texts directly within SquadFusion. Members will take care of updating their contact information and preferences. And you won’t have to worry about removing inactive members from your distribution lists. You can choose which groups receive ad hoc notifications. Remind everyone registration begins next week. Here is an example. We can send a reminder to middle school coaches who have not completed the coaching workshop. Save distribution lists based on organization properties. For example, all families in a particular program, or every player in a certain city. Set up notification rules in advance, so you don’t have to remember to remind people. Members can be notified when events are added to or removed from the schedule, or when they change. They can be reminded to RSVP if an event is coming up to which they have not responded. Some people like email, some like texts. Some like both, especially if it’s important. SquadFusion puts members in control of how they receive different sorts of communication. You can focus on the communication, SquadFusion will get it to your members the way they want to receive it. The result? They will pay more attention and be more responsive. provides the right tool for the right job. This helps everything run more smoothly. You show content your members truly want. Better and more relevant content leads to deeper bonds for the teams. Our sports club management software provides the right tool for the right job. League commissioners reduce their workload 80% with SquadFusion Sports Management App.